Our Ghost Bond XL Bundle comes bundled with Hairdoodle Adhesive Application Kit which includes one adhesive glue brush, one sponge brush and one contour applicator stick to make applying Ghost Bond easier ! Included brush is perfect for easy application of adhesive in wide areas, also works great in thin areas if turned sideways. Included wooden applicator is great for precise application of adhesive in those places where the brush is not practical. Included sponge brush serves as a great traditional brush alternative. Ghost Bond XL was specially formulated by Professional Hair Labs. With new improved features which include, extra moisture protection and higher melting point, you can have peace of mind and confidence that your bonding adhesive will hold up to the most intense climates. formulated under the auspices of a team of chemists who develop surgical adhesives. Professional Hair Labs always puts safety first. Ghost Bond contains no latex, no harsh solvents or any of the irritants frequently found in cheaper formulations. It has been specially formulated for oily scalps, high humidity, and heavy perspiration. Ideal for attaching your lace or skin system to your head. All you do is apply to the tip of your finger or use a small brush and then apply it on your skin and allow to dry clear taking about 3 to 5 minutes minutes and then apply 2 to 3 more thin layers to the scalp area let dry till adhesive is clear. Now attach the hair system to your head. Once you attach your hair system, you will need to rub area to create a strong bond. I like to use the back end of my hair brush and rub back and forth to create a strong seal/bond. You can clean your finger or brush using just water & soap. Remove your wig using just about any adhesive solvent. I prefer to use 99.0% Medical Alcohol. 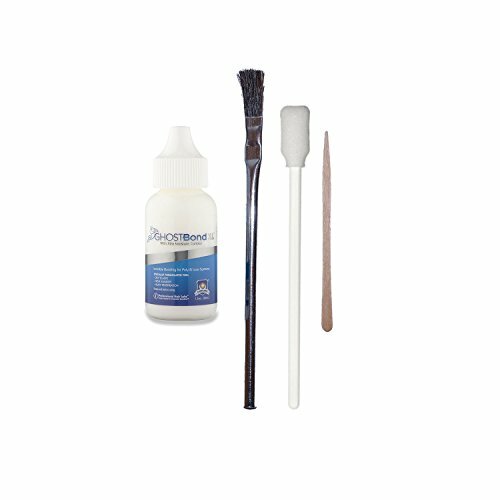 Comes bundled with Hairdoodle Adhesive Application Kit (one adhesive glue brush, sponge brush, and one contour applicator). If you have any questions about this product by Hairdoodle, contact us by completing and submitting the form below. If you are looking for a specif part number, please include it with your message.